Every year our church has a fabulous open house. One of the rooms is the Silent Auction Room. This room is pure profit because the church members do a little fall cleaning and bring the items to the church. 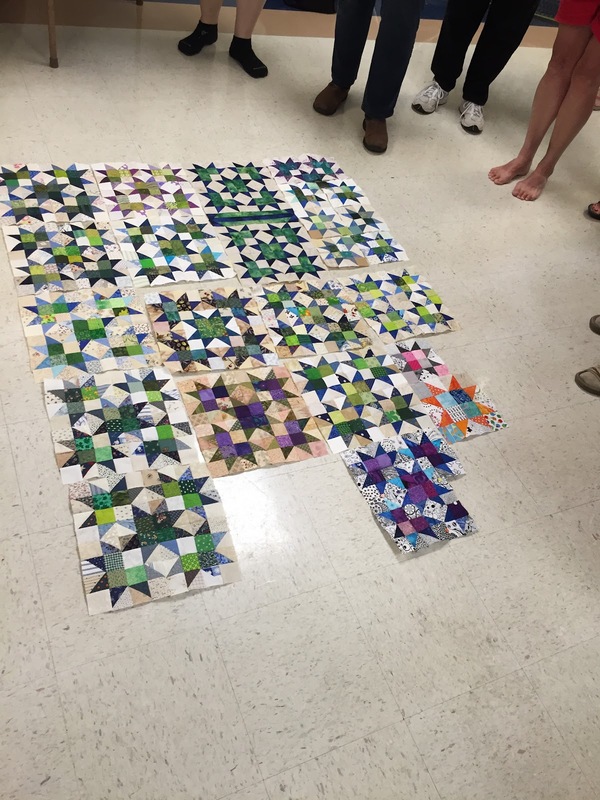 Some of the members get together to make a quilt every year. We have been doing this for almost 10 years now. The quilt tends to one of the biggest money makers in the the room. 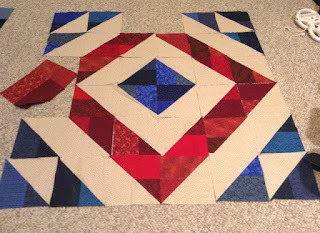 Here it the progress for this years quilt. The sashing is borrowed from Canuck Quilter's sashing found in the Quilter's Scrapbook. 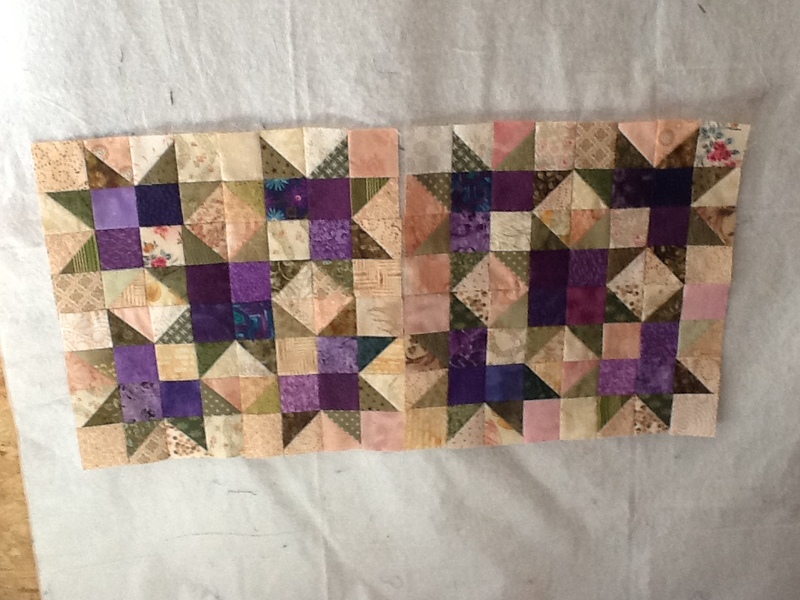 The blocks are done and a couple borders are all that is left before it makes it to the longarm. 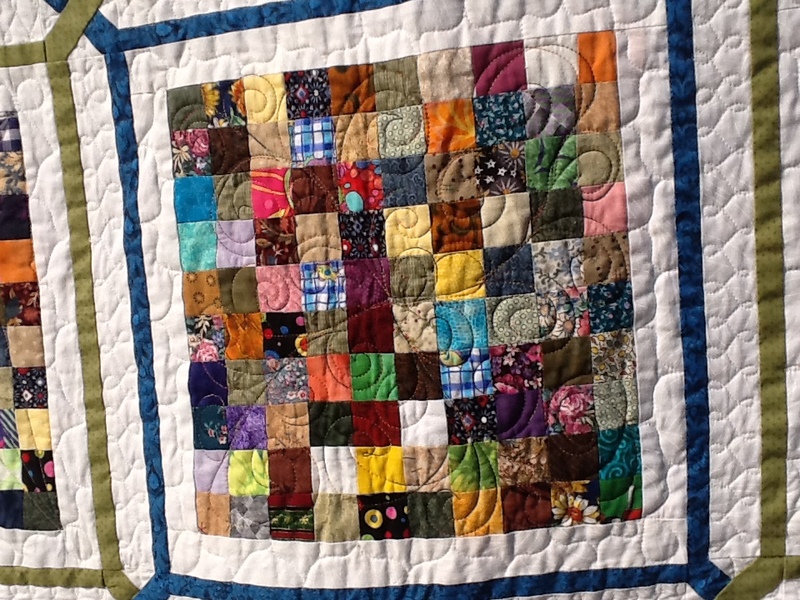 These squares started as bonus square leftover from last years quilt that included snow ball blocks. Visit www.sillymamasewing.com at the Fall Sewing Link UP! I get the opportunity to check out the Art Institute of Chicago. It is one of the few museums in Chicago I haven't visited yet. They have beautiful grounds right on Michigan Avenue. I hear the miniature collection is really cool. Don't know if there is a great fabric place down here. I know of 1 and it is a packed mess. Did purchase some fabric a couple years back. FYI-The appliqué is cut out. Not very happy with the looks. It needs some work. Maybe Sunday. Here looking at schools with MJJR. Next Month I am the featured speaker at a local guild. I have done some speaking and teaching over the years....but it still makes me a little nervous. The topic is "Using Your Scraps and Stash". I love to take the leftovers and make something beautiful. Inspiration usually comes from on-line photos. 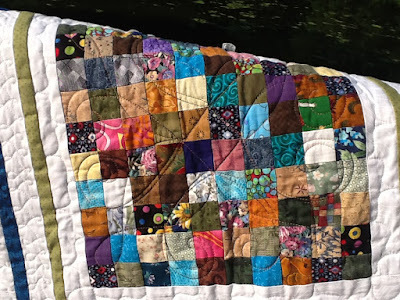 Scrap quilts usually begin with choosing a unit and a size. 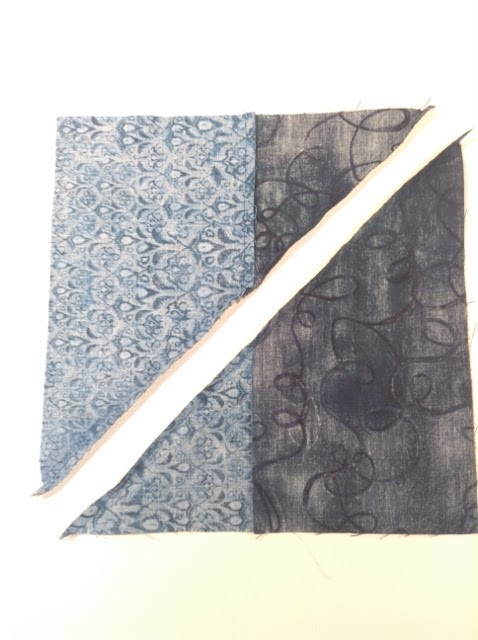 This scrap design began by having leftovers from 2" nine patches. Many of the strips had a useable chunk of fabric left at the end. By connecting the chunks together and picking a size.....1 1/4" x 2" the light and dark sides developed into these units. You can see the brown was added to have them flip flop back and forth. These rows will be added to a brown stash fabric. Applique will be added to the brown sections. The blue is the bias. Some flowers and leaves will be added. Always the challenge....is there enough brown. A border fabric to surround the whole thing to round out the quilt. Check and see how long this takes. Deadline...30 days. and with Cynthia for Oh Scrap! Heading to the Machine Now!! Scraptastic Tuesday is going on over at Mrs Sew & Sow. Check things out over there. 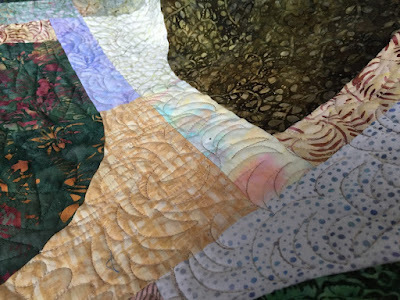 Last week I showed the Batik Leaf Quilt. So excited today when I dropped in to see the projects and found I was a gift certificate winner!! Check out the options that come with the gift certificate from Green Fairy Quilts. The latest project is machine quilting on the DSM a quilt made by a lovely lady from church. She had a machine quilter at least 10-15 years ago finish some of her pieces while her and her husband would winter in Texas. This quilt was slated to be quilted when they no longer could make the trip. Here is the close up of the blocks. The sashing and borders need to be finished. Below is the pattern that was slated for in the sashing. 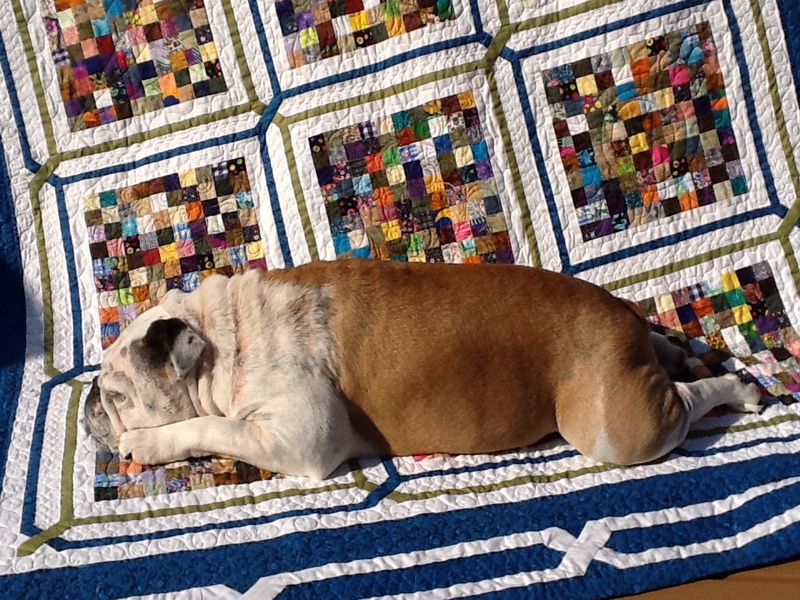 I am afraid that enough of the fullness won't be taken up with the quilting. The outside border will get the Baptist fan design. This is my go to design for the outer border. Any ideas to help quilt out some of the fullness. I suppose a meander might take up more of the fullness than the loops. Yesterday the last stitch was put in the binding. The sleeve was put on and hung up in the sew room. Late last night. It looks great in there. Enjoyed a little Netflix while it was hanging last night. I didn't take a picture in natural light before it was hung.....so this morning down it came. The sun was beautiful this morning. It was quilted on the long arm, which I still am growing accustomed to. Since the quilt was going in my sew room I decided that it was an opportunity to practice some new designs. 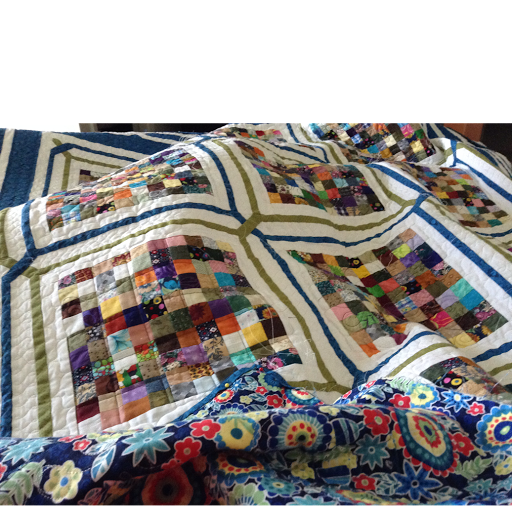 The quilt was sectioned off with double lines and loops. Each section has a different pattern. It gives some practice without a huge commitment. 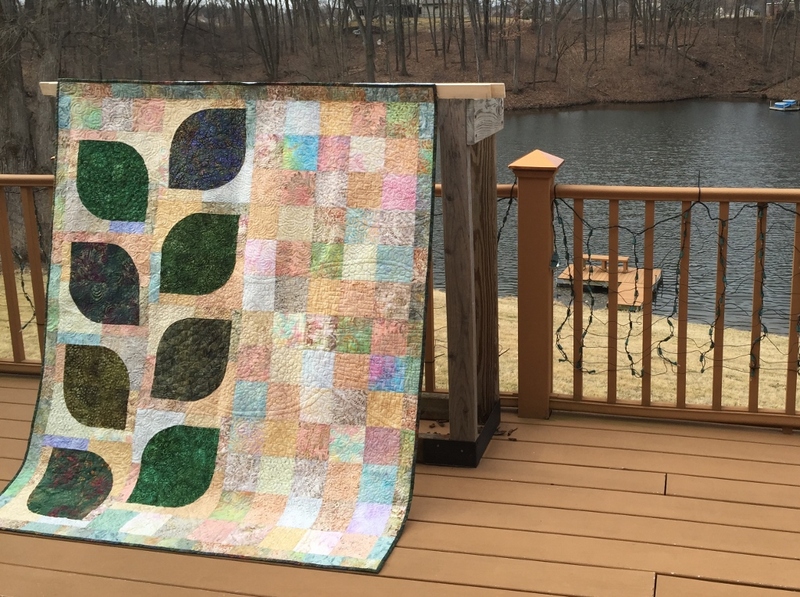 The quilt is made with blocks cut with the Accuquilt drunkards path block and 5" batik squares. The 5" squares are from the guild fabric exchange in February 2015. Check out the other projects at Connie's Linky Tuesday and with Mrs Sew & Sow Scraptastic Tuesday. 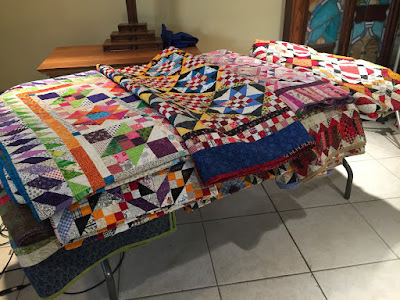 Recently I was asked to donate a quilt for a fundraiser for an organization at my husbands work. Currently there are no quilts that are set aside for this purpose. Frequently there is something laying about that is made from scraps that has no meaning or no scheduled home. The deadline for the drawing was close and I decided that it wasn't in the cards this year. After some consideration, I asked 3 others who have a tie to the facility if they were interested in helping....all said yes. What looks hard but isn't? That many can work on? Can use any pre-cuts that we already have? Will appeal to men (generally male work population)? The neighbor with her sister had recently made a quilt for her grandson who is getting married. It was beautiful and made with jelly rolls. And the neighbor stated how easy it went together. Off to do some research. The pattern is a 3 Dudes Quilting in Mesa, Arizona. After saving some pictures of the variety available in the pattern, this was the inspiration. 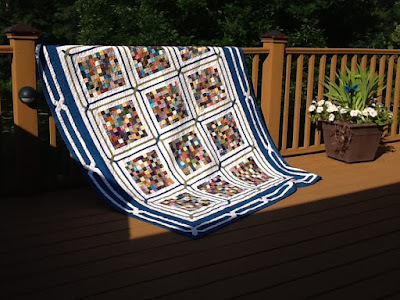 So a YouTube video is available from Missouri Star quilt company for this Quilt. This version has a slightly different strip set. But the strip set is available on-line, is made with jelly rolls and 1 1/2" black strips. And best part....looks hard without being hard. Here is some pictures of us working on it along with the final top. The quilting is done-interlocking squares. The fundraiser is going great and we are proud of the finished product. Thanks to those that made it possible in the 3 week process.